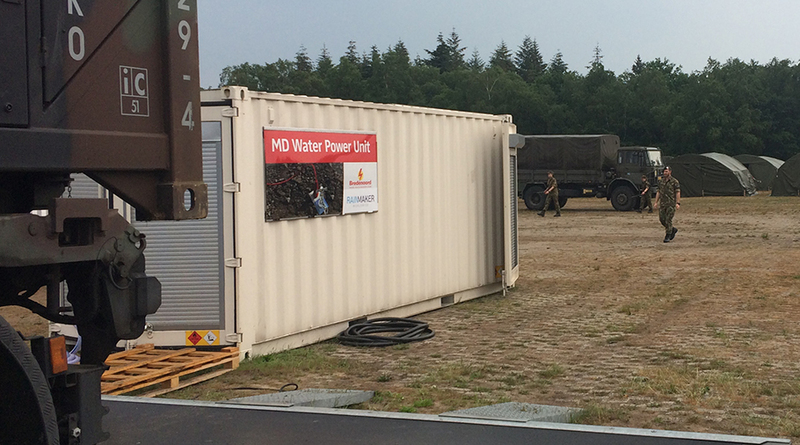 SOESTERBERG, The Netherlands, June 12, 2018 (GLOBE NEWSWIRE) — Rainmaker Worldwide, working with its partner, Bredenoord has delivered its innovative MD Water Power unit to Fieldlab Smartbase 1.0 for the Dutch Ministry of Defense. The smart base was officially opened by his Majesty King Willem-Alexander, the King of the Netherlands. The Dutch military participates in multiple UN missions and has served in Iraq and Afghanistan. It is currently active in a UN peacekeeping mission in Mali to fight local terrorist insurgents. In these missions, it is essential to minimize supply lines and reduce local dependencies to increase troop safety and maximize operational efficiency. Rainmaker’s core Water-to-Water technology has been successfully combined with Bredenoord’s state-of-the-art military-grade generators in a containerized plug-and-play solution that delivers both clean drinking water and reliable electricity. The unit reduces the cost of fresh drinking water, is highly efficient, mobile and ideally suited for areas where there is little or no infrastructure. The ultimate objective is to replace the current reverse osmosis systems with Rainmaker-Bredenoord units. Each unit can provide up to 25,000 liters of pure drinking water and 35 kW of electricity daily under all conditions without any power grid connection. This self-contained, low-maintenance solution is designed to be suitable for global military deployments, NGOs and disaster relief situations. Michael O’Connor, President and CEO of Rainmaker Worldwide said, “We are exceptionally pleased to have delivered this innovative application of Rainmaker’s Water-to-Water technology to the Smartbase Project in Amersfoort, Netherlands. We look forward to collaborating closely with the teams at Bredenoord and the Dutch military during the comprehensive testing period. Bredenoord is a family-owned business based in Apeldoorn, the Netherlands, with 80 years’ experience in the engineering, production, sale and rental of smart energy solutions. Nowadays, the company focuses on the development of more efficient and environmentally friendly power generators. Based on its Clear Concept philosophy, solutions are brought forward based on new fuels, new conversion technologies, increased efficiency and emissions reduction. In addition to the market in the Netherlands, Bredenoord operates in markets throughout Europe via offices in Germany, Denmark and Belgium. Bredenoord originally developed the Water Power Unit in 2015. This knowledge together with our focus to bring reliable power in its most efficient way was the basis for this joint development with Rainmaker Worldwide. For more information, please visit www.bredenoord.com.